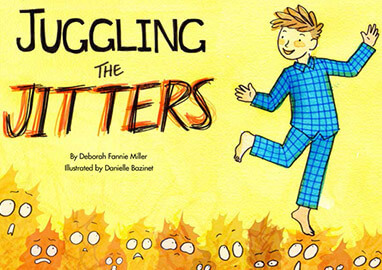 “Dealing with Feelings” picture books deal with difficult emotions in comic and comforting ways and provide tools to stop anger and anxiety from escalating out of control. The books are written for children in kindergarten through grade 3 to be enjoyed with parents, teachers, and other caregivers. Ever had one of those mornings, when you didn’t sleep well and didn’t want to get up and go to work, only to discover that your child was even grumpier? Before you knew it, the anger was just a little out of control. Right? Deborah Fannie Miller had a particularly grumbly morning with her 8-year-old daughter once, and while driving to school with the anger festering between them, she hatched a plan. That day, she wrote the first draft of Grappling with the Grumblies to read with her daughter when she got home from school. As a singer/performer, Deborah experienced the power of working through the feelings with her daughter in a playful and dramatic form and she knew she was on to something. Many drafts later came publication of Grappling with the Grumblies and then in March 2011 it won the Steffie Young Reader's Choice Award. In presentations, it became clear that children and their caregivers wanted the next book to deal with anxiety. And when do those feelings happen most? Nighttime. Going to bed seems to be the perfect storm for free floating Jitters to appear: alone in the dark with one’s thoughts running wild and free, and multiplying like—well—crazy! Children also told Deborah that birthdays were a major source of anxiety. So now we have a new book, Juggling the Jitters. Next up? By popular request, Nixing the Nopers will be the next “Dealing with Feelings” book which will address frustration at school. The plot of each book involves a parent and a mischievous “monster" (an external projection of the child character’s emotions) who happily hinders and then helps the child - with their anger in Grappling with the Grumblies and their anxiety in Juggling the Jitters. 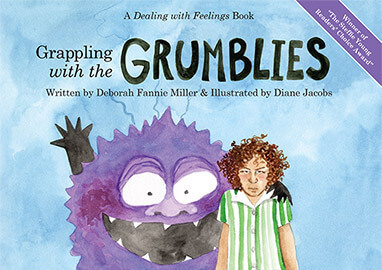 Through engaging and playful storytelling, Grappling with the Grumblies and Juggling the Jitters offer adults and young children practical tools to work through anger and anxiety together. — Judy Arnall, best-selling author of Discipline Without Distress, regular contributor to Calgary's Child Magazine and a regular guest on Global TV, City TV, Shaw TV, CTV. She is regularly quoted in national magazines such as Chatelaine, Today's Parent, Parents, Canadian Living, Natural Parenting, Parents Canada and Canadian Family Magazine, and newspapers such as Globe and Mail, Postmedia News, National Post, Metro News, and Huffington Post. She is a discipline/behaviour expert at Mothering Magazine Online.